EGX 2016 Interviews - Game of The Show? It's that time of the year again, a date thats always bookmarked in the Blast Process diary. 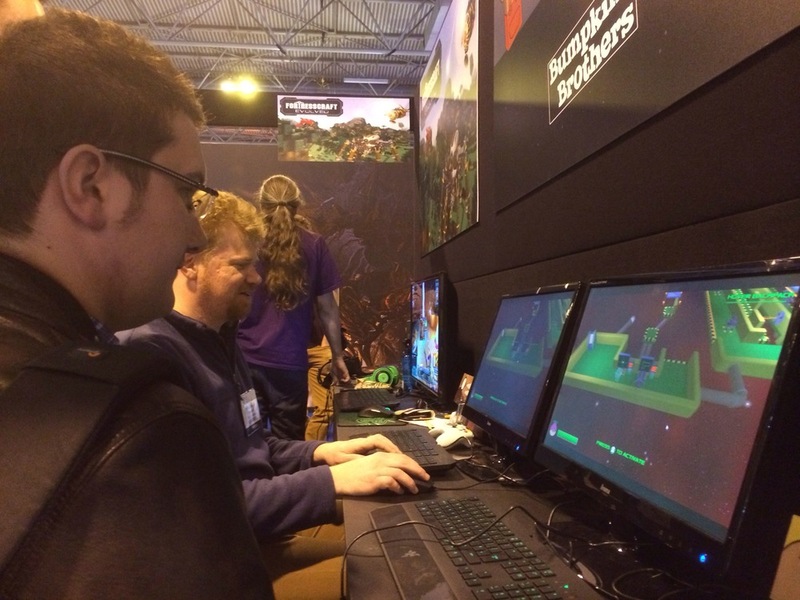 EGX is the UK's biggest gaming event that's held at Birmingham within the NEC. So what did we get up too? Here's a few of our Interviews that we carried out with some upcoming indie developers! Snake Pass is our clear winner going into our YouTube viewership but we'll be checking out the games come closer to release and let you know our verdict on them. Mike is our main go-to-guy for videos. Former 4Kings member and one of the original founders of BlastProcess.com, Mike has been here since the beginning. The main driving force of the website, Mike loves indie games and apps. So get in touch if you want your game/app featured here! We headed to Alpha 55 in North Wales for an action backed full day of Airsoft. Most of us were new to playing Airsoft, so with full training and gear from Alpha 55 we were all set for a fun day for Blast Processors Dave's Stag Do! At Alpha 55 we provide an Airsoft site that is owned and managed by PLAYERS themselves, offering a wealth of knowledge and experience of all things Airsoft. The woodland site in Halkyn, North Wales, has varied terrain including both in and outside play. During play you will come across minefields, Various bases, abandoned vehicles, buildings and all manner of defences; which all add to the gaming experience. All of your Airsoft adventures at Alpha 55 are supervised by our experienced marshals who will endeavour to give you multiple objectives and various game types which will throw you head first into the action. Every time you come to Alpha 55 you will have a completely DIFFERENT gaming experience. No matter your age, skill or experience we guarantee you a great day. This years Gadget Show Live has been and gone but theres always next year! While we did have a browse around at all the latest offerings within the gadget world, along with getting stuck inside a Tesla Model S.
We've always been drawn to the indie games section, as it has been each year. Why? because the teams behind these games are making the games of tomorrow, plus they can't help but talk about their game! Have a look at some of the games we talked about below with most you'll see coming to Steam, consoles and even you're local bar! Button Frenzy is a fast-paced score-attack game that will challenge your memory and reflexes. Line Wobbler is a one-dimensional dungeon crawler game with a unique wobble controller made out of a door-stopper spring and a several meter long ultrabright LED strip display. A game about building the biggest baddest ship by blasting your buddies' to bits and stealing their blocks. Blast Process head to Play Expo gaming event! Blast Process will be at this years Play Expo event held at Event City in Manchester, and it starts today! While we were very late is sorting our tickets, we will be at the event this Sunday. Play Expo is unlike any other event held in the UK. The event caters for different type's of gamers with the expo split up into five areas. Re Play. Now Play, Pro Play, Cos Play and new to this years event is Screen Play. If you enjoy retro gaming and arcades or dressing up as your favourite charater to playing the latest games, Play Expo will have something for you. Stop the press! No more hours on the road to find the comiccon of your dreams, gazing out the window at miles of the motorway and squashed packed lunches- Comiccon is coming to you! 'Stoke Con Trent' has crashed into the North West like an explosion of Comic book and movie joy to please the masses. This is only it's first year but is sporting legends such as Colin Baker (Doctor Who), Chris Rankin (Harry Potter) and James Cosmo (Game Of Thrones). Hosted at Stafforshire University, get ready for Cosplay competitions, exhibitions and a mountain of comic and memorabilia stalls to sink your teeth into. As a seasoned comiccon goer, I honestly cannot wait! I've traveled all over the UK to visit my favourite stars, squeal with excitement at the Q&A sessions and have the best time any comiccon veteran can go. The 28th September cannot come soon enough - get your tickets from the website here: http://stokecontrent.co.uk/about/ Don't miss out! The Blast Process team are currently at the Birmingham NEC for the Gadget Show Live! Follow our adventure around the show floor by heading to our Twitter feed (twitter.com/blastprocess). We've already played a number of fantastic indie games which we shall talk about in more detail in the next few days! The show opens to the public tomorrow (9th April). Tickets are still available online. For now though head over to @BlastProcess! Blast Process are going to Rezzed! We are back On Tour and heading to Razzed 2014! EGX Rezzed is a gaming event held at the NEC in Birmingham. See the latest PC, Indie and video games in action and join in and watch developer sessions that are held by some of the leading designers on todays biggest games. Sound's like fun? You can check out the full details and where to find tickets for this three day event, right here. Be sure to follow us on Twitter for updates surrounding the day and keep an eye out for our videos going up on Monday!